Let’s look at our top three picks for the best push reel lawn mowers of 2017. We want you to get the best value for your money. We narrowed down the choices based on features, company reputation, and feedback from users. Why choose a manual reel mower instead of a power mower? For one, a reel mower is economical; it fits into almost everyone’s budget. But there are lots of reasons besides the low purchase price. 5 If you aren’t sure that you’re ready for a push reel lawn mower, you still have options! All that sounds great…but aren’t there some negatives to owning a push reel mower? The two main wheels on either side of the mower turn when the mower is pushed. On the axle, a pinion gear with teeth turns in time with the wheels. That gear makes another gear on the blade reel turn. The blade wheel turns faster than the mower wheels are turning. The blade wheel circles around and pushes the blades of grass against the fixed cutting bar. Snip! Since the blade wheel is turned by gears, it spins faster than the wheels turn. That helps cut the grass more quickly. A yard that you could cut in 20 minutes with a power mower will probably only take about 30 minutes with a reel mower. Ten minutes isn’t much to sacrifice when you don’t need to pay for gas, oil changes, tune-ups, or deal with noise and fumes. See this video for a close-up view of how the blade reel works on a push mower. Reel mowers (aka hand reel or push reel mowers) have existed for over a hundred years. In all that time, some features have stayed the same while others evolved to take advantage of new materials. For example, the first iron and steel reel mowers were as heavy as some power mowers are today. Today’s reel mowers have aluminum and plastic bodies with steel blades so they usually weigh under 30 pounds. That makes them much easier to maneuver and store, and they don’t rust as easily. Ball-bearing wheels are another sign of a quality build. So is a blade design that doesn’t get jammed up by twigs and leaves. Good reel mowers will have a large range of cutting heights. The best mowers will have just one or two levers to change the height. Great States is part of the American Lawn Mower Company that also builds Scotts reel mowers. They’ve been in business since 1895. At the time of writing, this mower had nearly 500 user reviews on Amazon with an average rating of 4.3 out of 5 stars. Eighty-six percent of the reviews gave it 4 stars or better. We liked the Great States 415-16 because it is a very simple push lawn mower. It’s sturdy and does the job without fuss. It has a 16-inch-wide 4-spider (section) 5-blade reel that won’t need sharpening for years. The blades are made from tempered steel. The reel has a ball-bearing design for durability and that keeps it turning smoothly. The blade cutting height adjusts from ½” up to 2-3/4” high. The only downer is that the blade height is not easy to adjust. You’ll have to use a flathead screwdriver and socket wrench to take it apart and set the new height on both sides of the reel. If you plan to change cutting heights frequently, this is not the best mower for you. The other adjustment you may have to make is to the blades themselves. If they were banged around a lot during shipment, the alignment set in the factory might be off. If you notice that the mower seems hard to push or is giving a rough cut to the grass, pull out that screwdriver again. You might need to give a tiny turn to the screws that change the gap between the cutting bar blade and reel. The owner’s manual explains the process and provides images to show how it’s done. There is a small shrub bar welded on top of the mower so that you won’t trim low hanging branches by accident. The wheels also have ball-bearings for smooth mowing. The wheels measure 10 inches tall. The flared handles on the bar come with foam grips, and that’s nice on a hot day. Some users have commented that the foam grips wear out after a couple of years. The 415-16 mower weighs just 25.4 pounds and comes with a 1-year warranty. It requires the use of tools to assemble the handlebar. Great States recommends regular applications of WD-40, oil, or other appropriate lubricant to the blades, axle, and wheels. Gardena is a German company which is now part of the Husqvarna group. Their 4023 is another simple and straightforward push reel mower that has very positive ratings on Amazon. Ninety-seven percent of reviewers gave it 4 stars or better. Do keep in mind that it’s a narrow mower with a cutting width of just 15 inches wide, so it’s best for very small yards or areas with a lot of slim gaps between obstacles. The 4023 is thoughtfully designed. We love that it is very easy to assemble. It uses wing nuts so it can literally be put together without any tools. The cutting height adjusts between 0.5 to 1.65 inches with two simple screws you can turn by hand, one on each side of the mower. (If you prefer taller grass, this may not be the best mower for you.) Gardena says this model can mow down grass up to 4.72 inches tall without needing to cut it first with a power mower. The steel cutting blade reel has a non-stick coating. Gardena recommends cleaning off the mower after each use and spraying the reel with a lubricant. You can adjust the gap between the cutting bar and blades with a hex wrench, although the manufacturer says this is rarely necessary. The 4023 mower weighs 19.6 pounds. There is a grass catcher (aka bag) that fits this model but it is sold separately. Gardena offers a 12-month warranty with free parts and labor. If there is a problem after this period, they have a national repair service that will provide a free estimate. Our third top reel mower of 2016 is made by Fiskars. On Amazon, 86% of customer reviews give it 4 stars or better. It’s just an inch smaller in width than the Fiskars we reviewed last year, and has a lot of the same great features. For example, Fiskars offers a 2-year warranty, double that of the other two mowers described above. They are a company known for making quality specialty scissors, and the same great cutting technology appears in their lawn mowers. The five-blade cutting reel neatly snips grass without actually coming in contact with the cutting bar. This keeps the blades razor-sharp for much longer. You shouldn’t need to sharpen them for years. The large-diameter blade reel has what Fiskars calls its “InertiaDrive.” This means it’s easy to push, and it handles twigs, leaves, and thick grass without jamming as often as other reel mowers do. It makes quick work of cutting St. Augustine and other Southern grasses. We love that the cutting height easily adjusts between 1.5 and 3.5 inches using just two knobs, one on each side of the mower. We also like that the handlebar is padded and its height is adjustable. Fiskars recommends setting the cutting height first, then testing the handle height. If you can push the mower and turn it without bending over and without the front end rising up, the handle should already be at the proper height. The additional rear wheels help stabilize and balance the mower, while the plastic hood protects plants and shrubs from being cut by accident. The Fiskars 17-inch StaySharp Push Reel Mower weighs 40.3 pounds. That’s quite a bit more than the other two reel mowers here. But we didn’t see a lot of complaints that it is too heavy for average folks to use. The mower requires assembly using two wrenches sized 11mm and 18mm. After use, Fiskars recommends cleaning the blade reel with a dry broom or brush. They do not recommend using a garden hose because wetting the mower can cause it to rust. Lubricate all moving parts at least once a season or whenever the mower gets wet, and use a silicone-based product that leaves a dry film. Fiskars also sells a grass catcher (bag) that attaches to the rear of the mower. The catcher holds up to a ½-bushel of clippings. Keep in mind that most catchers or bags used on manual reel mowers don’t manage to collect all the clippings. See a Fiskars StaySharp mower in action with this video. Here’s where we compare the nitty-gritty details of these three top picks. If you have a truly tiny lawn, or very little space between obstacles like trees, consider getting the Gardena 4023. It’s just 15 inches wide, perfect for little yards and squeezing through gaps. It’s also the simplest to use, requiring no tools for assembly or adjustments. The widest mower of these three is the Fiskars 17-inch StaySharp. It’s also the heaviest. Avoid this one if you have to deal with hills or stairs. Finally, if you just want a sturdy grass-cutting machine with a great reputation, get the Great States 415-16. It’s from an American company and has hundreds of positive reviews on Amazon. Keep in mind that if you need to make adjustments, you’ll need tools. Sometimes you just want something bigger. If these three reel mowers seem too small for your lawn, check out our review of the Scotts Classic 2000-20. It is 20 inches wide so you cover the most ground as fast as possible. We didn’t cover mowers from Remington, Brill, Sun Joe, Outsunny, Greenworks, or a few other brands because they didn’t have enough positive feedback or had other drawbacks. Keep your grass under 4 inches tall. Push reel mowers will fold down tall grass without cutting it. Walk at a steady pace for an even cut. Overlap rows for best coverage. Avoid cutting wet grass. It may rust the mower and cause the blades to bind. Lubricate your mower according to the manufacturer’s instructions. See more simple tips for using a manual push mower when you click this link. We bet you won’t have to sharpen your new mower’s blades for years to come. But when it’s time, here’s how to do it. Third, place a wooden bar or stick through the reel to keep it from turning while you work on it. Use a blade sharpening stone (like for a pocketknife) and oil to make seven to eight smooth and light strokes along each blade. Follow the angle of the blade, and use the same number of strokes on each one. You can also try covering the blades with grinding paste and rotate the mower cylinder backwards for a few minutes. This is called “back-lapping.” See this video for how it’s done. Finally, if you don’t feel comfortable sharpening your mower yourself, don’t worry. There are kits for sale in hardware stores, and there are many shops that can do this service for you. With this chart of ideal cutting heights, you can see all of the push reel mowers in this review can handle Bermuda and Zoysia grasses. Great States and Fiskars can tackle centipede, fescue, and Kentucky bluegrass. If you have St. Augustine grass, your best bet is the Fiskars mower. There’s no more cord-pulling or frustration that your mower won’t start. If your push reel lawn mower won’t start, go drink your coffee and try again. You’ll never run out of gas unless it’s lunchtime and you’re hungry. It doesn’t matter if you mow at 6am or 6pm because it cuts so quietly. 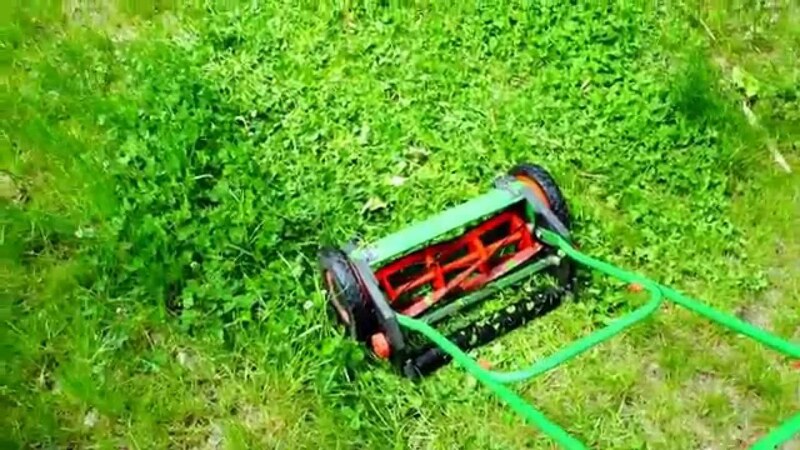 A manual reel mower is gentle to your grass. It doesn’t tear and rip; it just slices it neatly. If you aren’t sure that you’re ready for a push reel lawn mower, you still have options! There are corded electric and battery-powered mowers that will make your lawn look great but not pollute as much as a gas mower. See our reviews of the best lawn mowers.